Most commercial businesses aren’t too concerned with performing annual commercial cleaning in their offices. They might have janitors for everyday cleaning, but even a janitor can’t take care of the buildup of grime and germs that happens over time. While most businesses don’t think about the kind of mess that isn’t directly inhibiting their workspace, you can get a leg up on the competition by hiring a commercial and residential cleaning service and getting your offices spotlessly cleaned from top to bottom. If you think this sounds like a waste of time and money, think again. There are many benefits to commercial office cleaning that might not seem necessary on the surface, but that will in fact improve the productivity of your workers and, ultimately, your bottom line. A good commercial and residential cleaning service will provide you with such value that in the long run it will pay for itself. Let’s take a look at some of the biggest benefits to hiring professionals to do the job. 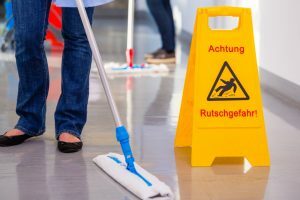 A janitorial workforce keeps your offices clean on a surface level: the trash cans are empty, the floors have been vacuumed, and the toilets have been cleaned. The same way that brushing your teeth every day is going to keep them clean enough to avoid cavities and other huge problems, janitors will keep your offices clean enough so that they don’t become a blatant pigsty. But we all know that while brushing your teeth is essential, nobody can clean your teeth like the dentist can. Just as you should visit the dentist periodically to get a deep clean and checkup, you should also use a commercial and residential cleaning service for your offices They’ll clean places you didn’t even know existed and bring everything back to a sparkling level of cleanliness—and it’s not nearly as scary as going to the dentist. With the buildup of unseen germs comes the higher risk of your employees getting sick. With a deep clean, you can rest easy knowing that you have done your part to eliminate potentially harmful germs that could make your employees sick, and cause them to miss crucial work days. Workers are proven to be more productive in a cleaner environment. Visible buildup of dirt and dust will lower the morale of your employees and ultimately cost you money as they become less productive. Raise their spirits and your profits with a top-to-bottom clean from a commercial and residential cleaning service. It can be tempting to just keep your offices clean to a bare minimum standard, but in the end you will have a happier workplace if you get an occasional deep clean from a commercial and residential cleaning service—and a happier workplace means a more productive workplace. 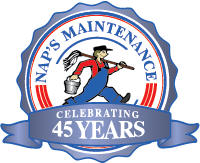 Hire a company like Naps Maintenance Service Inc. and you’ll get a cleaner, happier and more productive office.